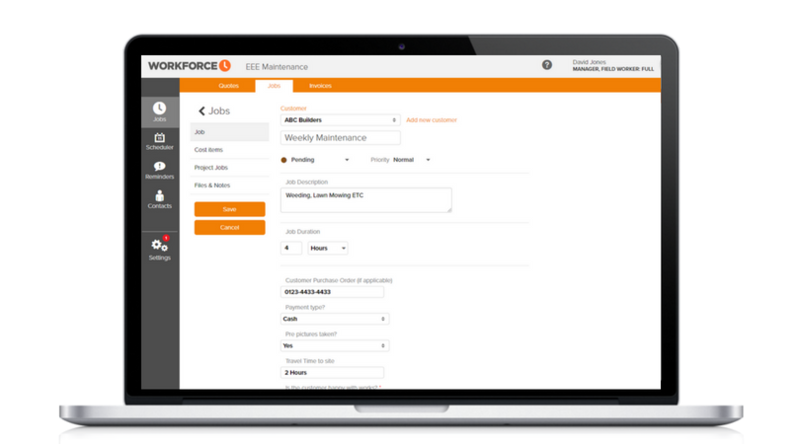 Workforce.FM is field service and job management software, designed to make your job simple. Our custom fields feature adds flexibility so that you can align Workforce.FM’s unique abilities with the needs of your business. When working in field service, you understand that most aspects of the job can’t be boiled down to a one size fits all solution. You have a responsibility to your customers to be adaptable to their needs, and not offer them a rigid cookie cutter model. For this reason, it’s important that your field service management software is as flexible as your service delivery. 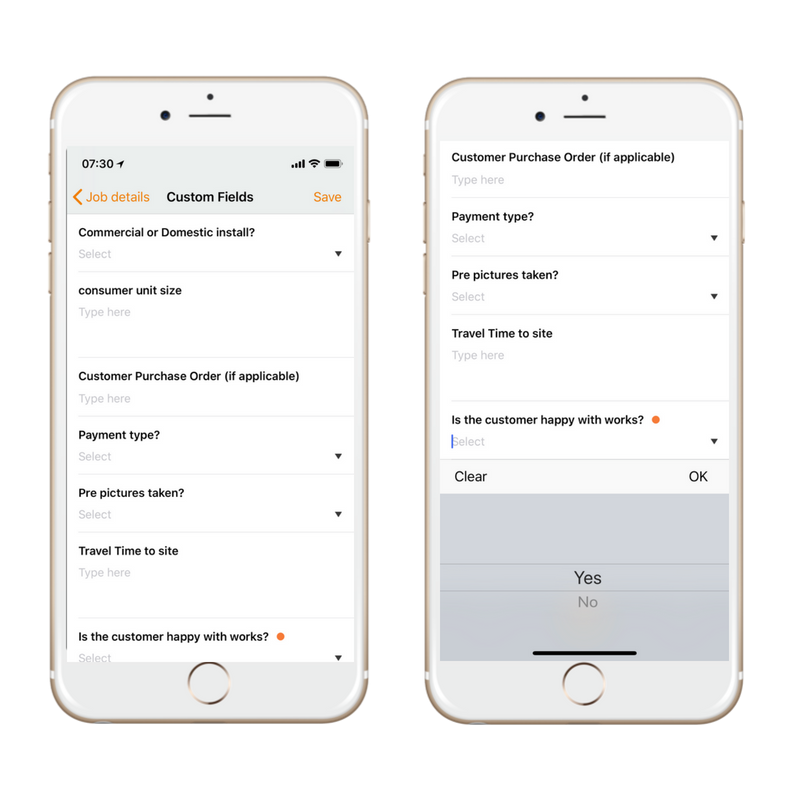 Workforce is a cloud-based mobile job management app for the field service industry that offers the ability to input custom data across your workflows as well as between customers. Personalise Workforce.FM in a way that suits your business and maximises your productivity. 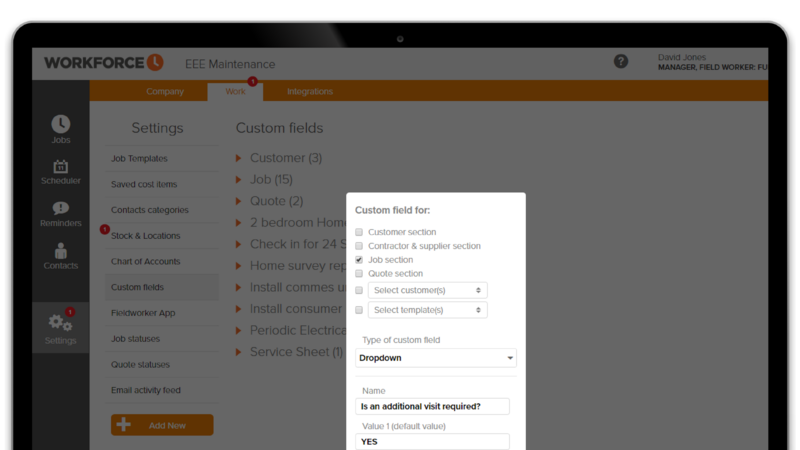 Because field service is so changeable between sectors and companies, no job management software is going to include all the features, menus or fields that every business needs. At Workforce gives you the opportunity to personalise your process to suit your business needs, adding free text, dropdown menus, date and time as well as text with suffix fields to your data inputting. This could apply to your purchase orders, quotes, invoices and much more. Once you’ve added and saved your custom fields, these will appear as a template for each new job, quote or invoice you create. You also have the power to add logos, more information about your company, bank details and instructions. If you need to deactivate these custom fields for a specific job or customer, this is easily done by returning to the Custom Fields settings and making the necessary changes. As well as adding custom fields that apply across the board when creating new jobs, quotes, invoices and more, you can also customise the information required for a particular customer. On occasion, a customer will have unique requirements that must be met in order for the job to be carried out. You will need to take note of essential information that is relevant for each and every task to be completed for that customer. Workforce.FM allows you to make note of building access details, special requests, serial codes or any other security and safeguarding information that your field workers will need to be aware of when approaching that customer or their site. Once saved, this information will populate whenever a new job is created for the customer. At Workforce, we’re very proud of the lengths we’ve gone to, providing custom fields and options for personalisation that make field service teams’ working lives easier. 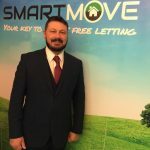 If you’re still not convinced, however, we offer a free, no obligation trial that will allow you to test drive our app. This is a full trial of all of Workforce’s amazing features, including custom fields, and comes with no auto-subscriptions. If you’re as satisfied as we imagine you’ll be with Workforce at the trial’s end, you can sign up from within your account. If for any reason you wish to discontinue, your account will automatically close after the 14 days are over. No commitment and no auto-subscriptions, just free access and an opportunity to prove why Workforce.FM is the leading field service management app on the market today.